A beautiful display of the Autumn colored Maple leaves on a log in the forest along the side of the road to Rock Lake in Algonquin Provincial Park in Ontario, Canada. Bright yellow, red, orange and green colored Maple leaves liven up the forest along the road to Rock Lake in Algonquin Provincial Park in Ontario, Canada during the Autumn season. Not only do the Maple leaves display vibrant colors during Autumn, but the Birch trees also show off their hues. Algonquin Provincial Park becomes a busy place during the Autumn season as thousands of tourists walking, traveling by bus, cars, bikes or motorbikes come here to see the colored forest. 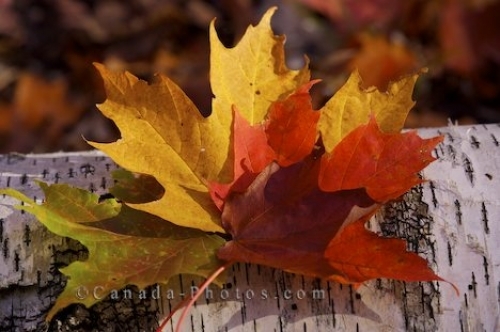 The Maple leaves are some of the prettiest and uniquely shaped with their distinctive outlines and pointed tips. As the leaves fall from the branches, the trees become barren but the forest floor is a mass of stunning color. Many like to walk through the leaves which creates a magical display for visitors to Algonquin Provincial Park, also becoming a paradise for photographers. Picture of Autumn colored Maple leaves laying on a tree along the road to Rock Lake in Algonquin Provincial Park in Ontario.